This is a tough list to compile for a lot of reasons. There are tons of great baseball players, many of whom played before I was alive, from which to choose. A brief debate over the best second basemen over the last 50 years I had recently with some friends over at Bryan Hanks’ blog inspired to revisit a piece I’d written before. I once did a best left-handed, right-handed and switch-hitting lineups with my old boss, Alan Ford, but I can’t find that anywhere. So, just for the fun of it, let’s take a swing at the best players in history. And yes, my lineup has a DH. He was a .267 lifetime hitter that hit 389 homers in a 17-year career with the Reds. He went to 14 All-Star games and was a two-time National League MVP. He also won 10 Gold Gloves, two World Series titles and is widely considered as the best defensive catcher of all-time. He won 10 titles, three MVP awards and hit almost 20 points higher than Bench, so he’s a strong candidate for this slot. Bench’s defense, for me, sets him apart in this debate, though. But any list with these two reversed is OK with me. It’s that close. The Iron Horse was unbelievable. He hit .340 with 493 homers and almost 2,000 career RBI. He’s a two-time MVP, he won a batting title and he played in 2,130 straight games. He also hit. 361 in the postseason and was a big part of six Yankee world championships – and his fielding percentage was top-five every year, too. Hit .325 and smacked 534 home runs in his career. He won three MVP awards and the triple crown in 1933. He was also a plus fielder, but Gehrig’s consistency and excellence are hard to trump. Hornsby could flat out hit, as his .358 lifetime average suggests. He was a two-time MVP and triple crown winner, and though he wasn’t as good with the glove as, say Eddie Collins or Joe Morgan, his stick puts him over the top. He didn’t break baseball’s color barrier until he was 28, so he doesn’t have the career numbers to beat out Hornsby. But make no mistake, Robinson is the second most important baseball player in history. And, as far as the Civil Rights movement goes, he’s one of the most important historical figures in the last century of American history as well. He’s best known for his power, with 548 career home runs. But he was also a three-time MVP and a 10-time Gold Glove winner as well. Power and defense. The prototypical third baseman. He was a superior hitter in terms of average and speed, but falls short of Schmidt in power and defense. This is my homer pick as an Oriole fan, and even I acknowledge that Honus Wagner is also a very good choice for this spot. But I’ll try to make the case. 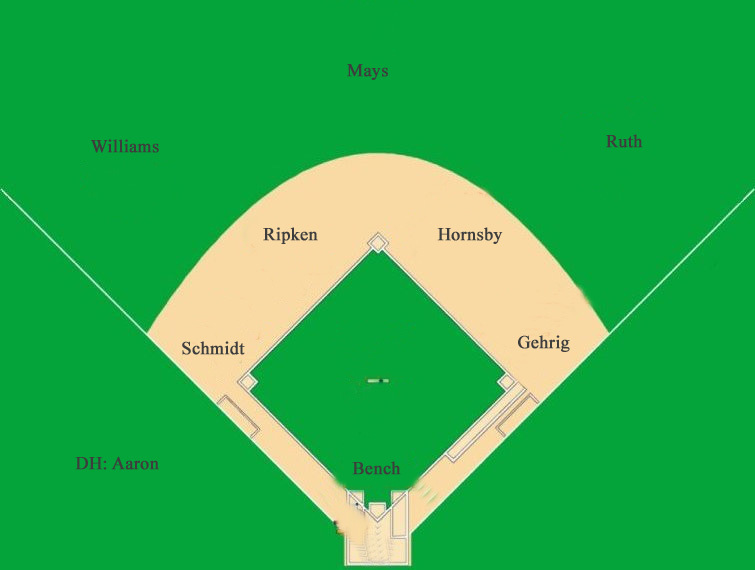 Ripken, of course, played in 2,632 straight games at shortstop, and then later, third base. He’s one of only eight players to reach 3,000 hits and 400 home runs. He was a two-time MVP and a 19-time All-Star. He only won two Gold Gloves, but he was consistently a top-five fielding percentage guy. He played in a ton of games, thus made more errors than his contemporaries. But he made a ton of plays, too. Enough to be third all-time in assists, in fact. Plus, one could argue that he helped heal the gulf between baseball and its fans in the wake of the 1994 work stoppage when he chased Lou Gehrig’s record. An original Hall of Famer with great offensive stats (.328 BA and 723 steals). And with all of those stolen bases, he was only caught 26 times. In addition, he was a top-five fielder every season. Even with three years of his prime spent serving his country in World War II, Williams stands alone as the best left fielder in history. He’s the game’s all-time leader in on-base percentage (.482), second all-time in slugging (.634) and was a two-time triple crown winner. He hit .407 in 1953, and no one has been over .400 since. “The Man” had a sweet swing (.331 BA) and could drive in runs with the best of them (475 HR and 1951 RBI). Plus, he’s a good man, which for me, puts him ahead of Barry Bonds. The original five-tool player. He hit for average (.302 BA) and power (660 HR). He won a dozen Gold Gloves and led the National League in steals four times. He was a racist, but he sure could hit. That .366 lifetime average led to him having the most hits in history. Hit a few home runs (714), hit for average (.342) and is widely considered to be the best offensive player ever. He could pitch, too (94-26, 2.48 ERA). Hit 715 career home runs, played his position well and exudes grace and class at every asking. 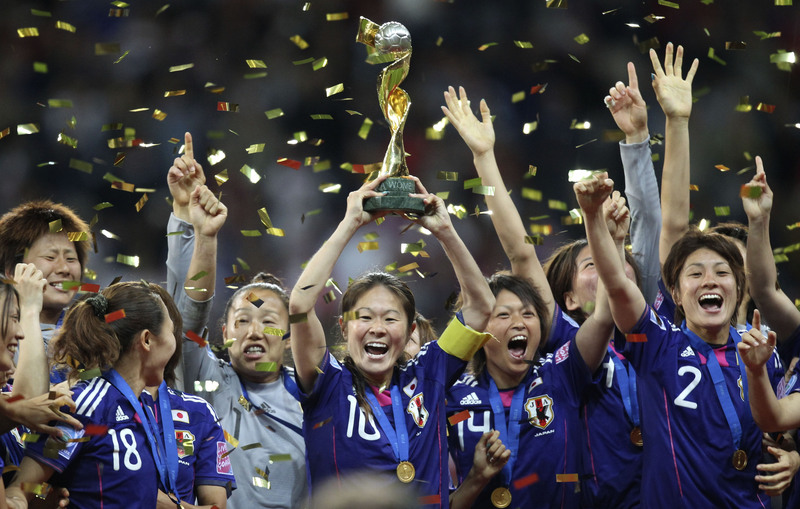 There are many lessons to be learned about the game of soccer, and indeed life itself, from Japan’s stirring victory over the United States in the Women’s World Cup final Sunday in Frankfurt, Germany. It sounds silly, but when you’re dominating the game, peppering the opposing net with shots and imposing your will on the other team, you have to get at least one goal to make it all worth while. Carly Lloyd missed a golden opportunity at the near post in the opening minutes and Abby Wambach’s blast thumped harmlessly off the crossbar at bit later in the first half. The United States kept coming in waves, but Japan kept them off the scoreboard – allowing them to get over their nerves and stay in the match. Japan scored its first goal in the 81st minute when Rachael Buehler and Alex Krieger couldn’t get out of each other’s way trying to clear a ball from the penalty spot. On some other day, that ball bounces out of the box and away from danger. Sunday, it landed at the feet of Aya Miyama, who put it past Hope Solo to tie the match. That forced extra time, and after Wambach’s header put the U.S. ahead again, Japan got another equalizer just three minutes from time. Again, on some other afternoon, the ball would have come in from the corner and Homare Sawa’s shot wouldn’t have taken an odd bounce off Wambach fooling Solo and tying the match yet again. I am sad that the United States didn’t win the 2011 Women’s World Cup. I’m disappointed that this team, which had that remarkable win over Brazil, didn’t write the storybook ending to the tournament for which we all hoped. But if a team needed something to cheer about and something to believe in, it was Japan. They fought back from a goal down twice and didn’t blink in the penalties – which is a far cry from the nervy effort the Americans offered. For one day, all was right in a place where few things have been lately. It’s a feel good story for a team that captured our hearts and a nation that needs our prayers. So, hats off to Japan.